This innovative resource supports learners in their study of IGCSE First Language English for both the core and extended syllabus options. The course materials have been carefully designed to encourage the development of key English skills that will reach far beyond exams and assessments. Learners not only gain the knowledge needed for IGCSE First Language English, but also have the opportunity to improve their reading, writing, speaking, listening and memory skills. 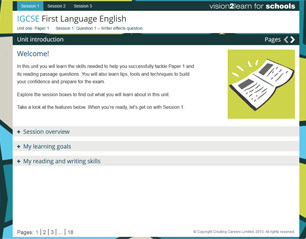 The core content is accompanied by fun learning features such as the online Motivation Map™ which helps learners to see how good English skills can unlock future opportunities beyond their IGCSE qualification. Supporting video content helps to build the learners’ confidence, with an online FAQ feature providing motivation and reassurance on common areas of difficulty, both in the exam and in the wider study of English. The course consists of four units, students will generally be instructed to complete either Unit one or Unit two depending on which syllabus option applies to them, alongside Unit three and Unit four. This unit is about understanding and acquiring the core reading and writing skills needed to complete the writer effects question, summary question and directed writing question of the IGCSE English Paper 1. This unit is about understanding and acquiring the extended reading and writing skills needed to complete the directed writing question, writer effects question and summary question of the IGCSE English Paper 2. This unit is designed to aid learners in practicing their understanding of what is required to be successful in the coursework component. It is split into sections which encourage the gradual acquisition of key skills by encouraging the learner to build, develop and then apply their knowledge on the subject. This unit introduces and explains the expectations of the speaking and listening assessment in an engaging and confidence-boosting design. It will guide learners through methods of tackling this component of their IGCSE while encouraging an exploration of independent thoughts and ideas.